Part one of this series introduced us to the concept and overview of this most invigorating subject of breath-hold diving. In this part, we continue to delve further and investigate the equipment that is used in practising this activity. All sports and active pursuits innately attract the use of equipment and the application of science and technology for improvement, enjoyment, safety and expansion. Breath-hold diving is no exception and a myriad of different gadgets, gimmicks and useful equipment have been spewed forth from the fertile minds of designers and inventors alike. The onslaught of modern technology and the glittering array of fancy goodies can never detract from that most nascent entity of breath-hold diving – immersion of the human body in water while holding one’s breath, and the experience of ultimate freedom that it is imbued with. Without further ado, let us look at the equipment used in breath-hold diving. Breath-hold diving at its most quintessential requires very little in fact, and at its most basic level there are only two requirements. A body of water is essential, and variation in this regard is noted. Sea water or freshwater, the open ocean or a large tub, choice will determine which. A human body with factory-fitted mind is the second requirement. Desire and passion in a person to want to hold their breath and immerse themselves underwater fulfils the basic needs. Therefore, a human being with a certain degree of fitness and a body of water will espouse breath-hold diving. This then is breath-hold diving in its most pure form. In reality, this is seldom practised anymore, except maybe by the skin divers in the South Sea Islands and other areas where divers literally dive naked into the water and swim down while holding their breath to achieve whatever goal they have set themselves. Truly the bare essentials! In this current day when one considers breath-hold diving, there are certain types of equipment that instantly spring to mind. These items are common to all types of breath-hold diving and used in varying degrees. Breath-hold divers use wetsuits frequently, and the diversity available is reflected in the diversity used. One-piece and two-piece wetsuits are used most often, with form-fitting and streamlining appearing to be important considerations. The thickness of the wetsuit is matched to the water temperature and personal comfort of the wearer, and the use of hoodies, gloves and booties follows a similar pattern. Aside from the obvious thermal benefits that wetsuits offer, there is also the aspect of skin protection from the elements, underwater structures and naturally occurring potential hazards. Jellyfish stings are painful, potentially lethal, and don’t do much to enhance the natural skin tone of exposed skin. With regard to styling, colouring and markings, individual preference is the casting vote. Fins provide that extra power and speed that is needed for staying under the water for maximum purpose in the relatively short time periods that breath-hold diving viably allows for. Traditional type fins are used, but longer, stiffer and narrower bladed fins are often the preferred choice. These types of fins give more speed with a better economy of movement, which is important in prolonging the diving activities. incurring the necessity to “waste” air. To reduce the air thieving that occurs when equalising a mask, low volume masks are the preferred device to be used. The human body is generally positively to neutrally buoyant in water, more so in sea water, with variation while breathing in and out at the surface. A wetsuit is positively buoyant and keeps one floating but impedes the progress of getting down to depth. The deeper one goes, the less the effect, but substantial energy is wasted to overcome this. Earlier in breathhold diving, proponents would use rocks to help them get down to depth. The more modern approach is to use weight belts, wrist weights and even neck weights to overcome this positive buoyancy. Ideally, the breath-hold diver is slightly negatively buoyant to maximise energy conservation while diving down. An important consideration is that weighting devices need to be easy release so that they can be readily dumped in an emergency situation. Some of the above-mentioned devices, by their nature or their abandonment, act as safety devices. Additionally, there are devices that are employed specifically for this. Safety lines attached to buoys on the surface, and possibly with additional lines attaching the diver to the safety line, are commonly used. This provides surface visible markers for and of divers, as well as aids to descend and ascend on. Divers in varying degrees, depending on risk acceptance by said divers, employ various inflatable sausages, emergency lights, whistles and such like devices. Float lines and fl oat devices can also be viewed as safety devices in terms of spearfishing. Perhaps one of the most effective and often overlooked safety devices in breath-hold diving is the dive buddy or safety diver. A vigilant, trained and adaptable dive buddy can mean the difference between a campfire story and an untimely demise. Several adjunctive devices are routinely utilised to enrich the whole breath-hold diving experience. Some devices add to the experience, some bring an element of practicality, others improve the comfort, and yet others are merely for pure vanity’s sake. Breath-hold divers use snorkels at times, especially spear fishermen while on the surface looking down for fish; dive computers that measure depths, times, temperatures and a myriad of other useful (or useless) information can even be regarded as almost indispensable; nose clips free up a hand that would otherwise be engaged in equalisation manoeuvres; underwater lights and torches help to illuminate the underwater environs at night or at darker depths; underwater cameras grant the satisfaction of posterity guardianship; knives bring a sense of security in direct proportion to their size and number of serrations; and spearguns, with all their tempestuous paraphernalia, separate the hunters from the gatherers and evoke the ire of the green. It is self-evident that even breath-hold divers, for all their emphasis on the purity of their activity, at times succumb to the lure of materialism. Suffice it to say, every sport has its specific toys, and breath-hold diving is no different. 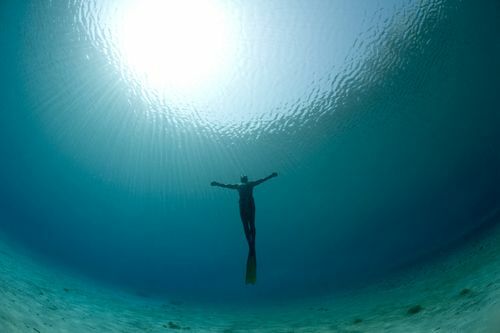 The mainstay of such device use is in the more extreme or sport forms of free diving. For the sake of brevity and clarity, let us discuss three such devices. This is a specialised type of fi n which has a wide single blade and two foot pockets. It emulates the tail fin of cetaceans and the method of use is called the dolphin kick. Speeds of up to 12 km/h have been obtained while wearing it and it is believed to have a good energy-used-to-speed ratio for breath-hold diving. These are goggles fitted with special lenses and filled with saline solution, thus obviating the need to equalise a mask space and thereby avoiding precious air loss, but still allowing adequate visualisation. Weighted sled: A weighted device that a freediver can hold onto while descending to depth, which then helps to conserve energy as little is expended on the descent. Depths for the sled can be pre-confi gured for record attempts. The ascent is then made with balloons, air lifts or own steam. Depth gauges and timing devices are generally incorporated onto the sleds. This concludes our discussion on the equipment used in breath-hold diving and hopefully sheds a little light on this oft misunderstood passion. In the next edition we will entertain a little physics and fl ash a smidgeon of physiology as it pertains to breath-hold diving. Stay prescribed! Brubakk Alf O. & Neumann Tom S. Bennett and Elliott’s Physiology and Medicine of Diving. 5th edition. Edmonds Carl, Lowry Christopher, Pennefather John & Walker Robyn. Diving and Subaquatic Medicine. 4th edition.